Recently, I’ve been trying to write at least a short review of every book I read. The latest on my list: Centauri Dreams, by Paul Gilster. Centauri Dreams. What a name. I noticed it on a blogroll this summer and was instantly drawn in to Paul Gilster’s blog. It embodies everything that’s wonderful about blogs and the web. Interstellar travel is a niche topic. Almost nobody works on it for a living. I’d be lucky to find any books in a library on the topic, and if I did, odds are they’d be from the Apollo era, if not earlier. But with Centauri Dreams, I get a relevant, up to the minute story every day. 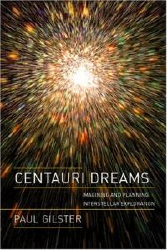 After a few weeks of reading the blog, I realized that there was a book to go along with it (yes, this seems backwards) and Centauri Dreams the book quickly shot to the top of my reading list. It even inspired me to get a library card in Mountain View! The book is a summary of all the major ideas that have been advanced for interstellar travel in the last fifty years. The problem is a difficult one. Even the New Horizons spacecraft, the fastest ever launched, would take 80,000 years to get to the nearest star. It would make more sense to wait and develop new technologies, and there’s a detailed discussion of the Wait equation. Much of the book is devoted to exotic propulsion methods and the men who dreamt them up. The author clearly admires these visionaries, and has read all their books. Even the bad science fiction that they wrote on the side. There’s Freeman Dyson and the legendary Orion project, which recommended denoating nuclear bombs underneath a spacecraft and riding the shockwaves in the 1950s. The success of the Mercury program and the Nuclear Test Ban Treaty put an end to that. Then there’s Robert Forward and his solar sail (check). A solar sail would be tens of kilometers across and incredibly thin. It would be propelled by photons from the sun, and thus wouldn’t need to carry fuel. This would make it incredibly light. Viewing the development of space flight through the prism of these programs was eye-opening. Much like Tom Wolfe’s The Right Stuff, it shows that the rosy picture of rapid, brilliant technological advance and heroic astronauts isn’t the whole story. From the standpoint of interstellar travel, the 1950s were a golden age. The space age was coming quickly and there was infinite potential. Doors were wide open: exotic ideas like Project Orion were given funding and a chance to prove themselves. But then we had to go to the Moon by 1970, and suddenly there was no room for anything but man-carrying rockets. Projects like the Solar Sail would foreverafter be second-class citizens. There are problems other than propulsion, of course. Gilster also talks about communications, nanotech and AI. The AI discussion was awful and used old results to try and create a sense of hope where there is none. The nanotech discussion was far more interesting. Lowering a ship’s weight has fantastic effects on travel time, so miniaturization could go a long way. I pictured an interstellar mission as a swarm of microscopic ships, each specialized and capable of communicating with the others. If they were small enough, they could just be individually accelerated towards the stars. I don’t know what the masses and speeds would have to be for this to be reasonable, though. An interstellar mission won’t have any hope of getting funding until telescopes start taking pictures of blue-green worlds around sun-like stars. And there’s a lot of work on that front. I’m excited about the ESA’s COROT mission that’s being launched in late December and NASA’s Kepler mission in 2008. The Centauri Dreams blog is a great way to stay up-to-date on such news. The book is not. I whole-heartedly recommend the former, and maybe 2/3-heartedly recommend the latter. Go check out Pitchfork’s 200 Greatest Songs of the 1960s. I always wished they’d do a Sixties album list in the same style as their 1970′s, 1980′s, 1990′s and 2000-04 lists. That won’t happen now, but a Singles list is a pretty good consolation prize. I already knew a fair number of the songs on the list, and I suspect that anyone else who went to High School in the English-speaking world can say the same. Here’s my initial take on the top 21. Eight of them were new to me. If you want to listen to any of them legally, iTunes will have most, and the Pitchfork version of the list has info on what CDs to buy. If you lack scruples, you can just get in touch with me. Lots of fun, and everyone’s heard it. Not everyone knows the story, though. Beatles release Revolver. Beach Boys one-up with Pet Sounds. Beatles one-up with Sgt. Pepper. Beach Boys prepare to one-up that, and this will be the smash single. But then Brian Wilson loses his mind while recording it. This song sounds wonderful, and the story is edgy enough to make me buy a placement this high. How many songs like this feature a girl singing about how she needs to break up with her boy so he can be a bad guy in a gang again? Very cool. This song is super-sweet, and it’s fine, but I don’t understand why it’s ranked so highly. There’s only the slightest hint of anything outside a cookie-cutter life here (“and then he kissed me in a way that I’d never been kissed before”). Instead of taking her to his home to MEET his parents, couldn’t they do that when the parents aren’t around? Be just a little edgy, please! “I ain’t no Senator’s Son!” What a hook, what a song. I wish we had protest songs this tight and scathing now, not John Mayer singing this crap about waiting for the world to change. I guess the song is OK, it’s just the “1969″ that sticks out at me. This sounds like something from the eighties. It reminds me a little bit of Sonic Youth. “Freedom,” that’s the chorus that gets sampled all over the place. But thinking’s a good idea too. Can’t argue with that, Aretha. I knew the opening bit from a commercial. Having listened to the rest of the song, they chose the right part to sample. I’ve had “Southern Rock Bad” pounded into me just a bit too hard to enjoy this on its own terms. Here’s one that really jumps out at you. It sure jumped out at me the first time I heard it as a freshman riding to school way back in the day. Go look at the picture of the Stones on Pitchfork. GOD he’s got a big mouth. Ah Zeppelin. I don’t know that I would have chosen this as their best single of the 1960′s, but it’s certainly up there. Honestly, how many people can scream “The soul of a woman was creaaated belooooooooooooooow” to an audience of millions and still get as much action as Robert Plant? Now that I think about it, this song is pretty awesome. I can’t complain. I’ve never liked Reggae much, so I guess this song is Great in that it helped start a genre, but I’m not so convinced it’s a great song. Yeah, this is solid. It’s The Who, it sounds like The Who, and The Who Are Cool. I’m so sick of Johnny Cash. Cool setting, cool song, sure, but I skip this one. This song might be my #1. It’s certainly my favorite Beach Boys song. Anyone who dated in High School will be able to relate instantly. This was the song that sold me on Pet Sounds and made it one of my favorite albums. Oh fine. I’ll be your baby if it’s really that important to you. This song is super-sweet, but w/o Pitchfork’s description I wouldn’t have known the technological/music history reason that it was ranked so highly. According to them, it’s the first single that was impossible to reproduce outside of the studio. Meh. I’ve never understood the Best Beatles Song Ever label that it often gets. I’d rate Tomorrow Never Knows higher than this. That being said, it’s a good and tremendously interesting song. It has an incredible sense of resignation all about it. The sound of someone “kicking open the door to your mind.” I always worry that people feel obliged to pay lip service to Bob, so I’m skeptical of all such airy statements. Go listen to it yourself. It’s an incredible song that should send chills down the spine of anyone who’s recently moved out into the real world. (note: Google is not the real world). Bob looks so young in the Pitchfork picture. “Ah was bawwwwn by the rivuh…” This was the real winner of the list for me, the most fantastic song that I would never have found on my own. No white man has ever had a voice so incredible as Sam Cooke’s. I’m almost embarassed to sing along. The song is filled with depressing anecdotes, but it always gets back to that chorus, that a change gonna come. I’m so happy that PItchfork made this #2. Who doesn’t love this song? What scares me is that MJ must have been around my little nephew’s age when he first sang this. What’s that like to be outclassed by a ten year-old? “The world could show nothing to me, so what good would living do me? God only knows what I’d be without you.” I think Pitchfork is picking this song because it hits so many Sixties themes. It’s the sweet sort of love song that seems typical of the early 60′s. But as they say, it’s a song riddled with anxiety and dependance. Having the “Wouldn’t it Be Nice” feeling is most certainly a good thing, but you don’t want to feel like “God only Knows,” and in that way, I suppose it’s a more nuanced song than #7. But if anxiety’s what they want, where’s “Caroline No”? I love this song, but I wouldn’t put it at number one. I like numbers 2, 3 and 4 better right now, but this choice may very well grow on me. Can you figure out how this program does it? Convergence is pretty bad, probably O(sqrt(log N)), but it’s cool that it works! Tennis World #1 Roger Federer is playing World #2 Rafael Nadal in a few hours in the Masters Cup semifinals. I assume that Federer will win, but he has a history of bringing out the best in Nadal in a way that he doesn’t with anyone else. It should be a great match, but unfortunately, they’re playing in Shanghai, and no networks in the US are carrying it live. So I have to watch it rebroadcast at 7 PM PST on ESPN2. Gmail Web Clips. They’re great, but I had to remove ESPN.com from my set after it ruined two previous matches in this tournament for me. Wikipedia Watchlist. Not a conventional source of spoilers, but I had at least two late-round Wimbledon matches ruined this way. There’s going to be a flurry of activity on the Federer and Nadal articles today. Random web surfing. You just never know. Sports tickers. I’d like to watch the Michigan/OSU game, but I’m terrified. So no email, wikipedia, web surfing or TV. Hopefully I’ll emerge from under my rock tomorrow in time for the match! Add the “Subscribe…” link from Settings -> Goodies to your toolbar, or use this link: Subscribe… there. Close the tab/window. Don’t hit subscribe! As always, you can subscribe to my shared items using the link on my Blogroll.